Born in Broughton-in-Furness, Robin Philipson moved to Scotland in 1930. He studied at Edinburgh College of Art (1936-40), and became a lecturer there in 1947. 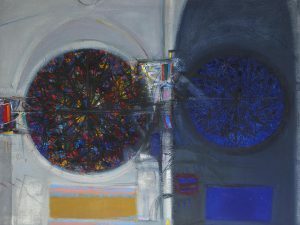 He was a significant and influential presence on the Scottish Art Scene for more than three decades. He had numerous commitments as Head of School of Drawing and Painting at Edinburgh College of Art and eventually President of the Royal Scottish Academy but was above all a practising painter. He was strongly influenced by William Gillies and John Maxwell, who were fellow members of the group known as The Edinburgh School. He was knighted in 1976. There are four works by Philipson in the collection. He is particularly renowned for his cockfight paintings, a series begun in the early 1950s. 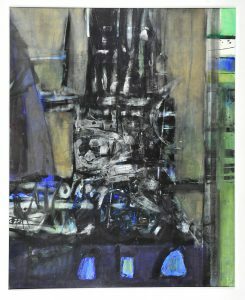 His later work in the 1960s included church and cathedral interiors and crucifixions. This painting was a gift from the artist in memory of the first University Principal Tom Cottrell.